Debt collection efforts around the United States rely heavily on litigation to collect past due debt. The ease of obtaining default judgments and garnishment orders has led debt buyers to use the courts as a critical tool for extracting payments from consumers, despite the lack of documentation showing that the consumer actually owes the amount claimed. Debt buyers are skilled at using the court system for collection purposes, but the people they sue typically are generally ill-equipped to fight the claims in court on their own and cannot retain counsel. Previous research has established that debt buyers often abuse these legal channels, thereby denying consumers the opportunity to defend themselves. Once the cases appear in court, the debt buyers often fail to provide proof that they own the debt or that the defendant incurred the debt. In the worst instances, free from the obligation to provide proof of debt to the courts, debt buyers may even sue people for a debt they do not owe. Debt buyers and associated law firms often win their cases, making it possible for them to use the court system to collect on debts via wage garnishments and even liens on consumers’ property. 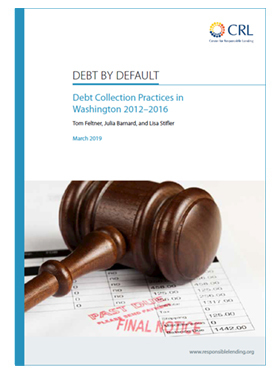 In this report, CRL explores the extent to which these problems, which are known to be associated with debt collection in other states, occur in the State of Washington. This report analyzes complaint data that Washingtonians filed with the Consumer Financial Protection Bureau (CFPB), as well as more than 20,000 cases one large debt collection law firm filed in the state between 2012–2016. Consumers and servicemembers in Washington have raised significant concerns about improper debt collection practices. An analysis of complaints to the CFPB shows that debt collection complaints are the second most common type made by Washingtonians, and the most common type filed by Washington’s servicemembers. Most debt buyer cases result in default judgments. Over 80% of all debt buyer cases reviewed resulted in default judgments in favor of the plaintiff. The prevalence of default judgments indicates successful and unchallenged collection efforts for the debt buyers reviewed in this study. For people sued by debt buyers, this means they are subject to a judgment or garnishment order without the debt buyer ever proving their case or the validity of the debt. Consumers almost never have representation. From 2012–2016, one large law firm frequently representing debt buyers filed 21,354 collection cases in Washington’s Superior Courts. Only 1.2% of defendants were represented by an attorney, and in cases where the outcome was a default judgment, defendants were represented in just 45 cases (0.4% of the time). Without being present or represented in court, consumers are not able to demand proof of debt or defend against unwarranted legal actions. “Pocket service” may be occurring in almost 70% of the cases reviewed. In Washington, a summons can be delivered prior to the case actually being filed in a practice called “pocket service.” Individuals served must respond within 20 days or they are in default—a time frame that applies even if no court case actually exists. Of the cases reviewed, nearly 70% were both filed and resolved with a default judgment within 20 days, indicating that many of these cases were likely subject to pocket service.